The possibility that simultaneous expansion of T regulatory cells (Treg) and T effector cells early postinfection can confer some immunological benefits has not been studied. In this study, we tested the hypothesis that early, simultaneous cytokine expansion of Treg and T effector cells in a tissue infection site can allow these T cell populations to act in concert to control tissue inflammation/damage while containing infection. IL-2 treatments early after Mycobacterium tuberculosis infection of macaques induced simultaneous expansion of CD4+CD25+Foxp3+ Treg, CD8+CD25+Foxp3+ T cells, and CD4+ T effector/CD8+ T effector/Vγ2Vδ2 T effector populations producing anti-M. tuberculosis cytokines IFN-γ and perforin, and conferred resistance to severe TB inflammation and lesions. IL-2–expanded Foxp3+ Treg readily accumulated in pulmonary compartment, but despite this, rapid pulmonary trafficking/accumulation of IL-2–activated T effector populations still occurred. Such simultaneous recruitments of IL-2–expanded Treg and T effector populations to pulmonary compartment during M. tuberculosis infection correlated with IL-2–induced resistance to TB lesions without causing Treg-associated increases in M. tuberculosis burdens. In vivo depletion of IL-2–expanded CD4+Foxp3+ Treg and CD4+ T effectors during IL-2 treatment of M. tuberculosis-infected macaques significantly reduced IL-2–induced resistance to TB lesions, suggesting that IL-2–expanded CD4+ T effector cells and Treg contributed to anti-TB immunity. Thus, IL-2 can simultaneously activate and expand T effector cells and Foxp3+ Treg populations and confer resistance to severe TB without enhancing M. tuberculosis infection. Interleukin-2 is a T cell growth factor, predominantly activating cells expressing high-affinity IL-2R comprised of three chains, as follows: IL-2Rα (CD25), β (CD122), and γ (CD132) (1). Whereas CD4+CD25+Foxp3+ T regulatory cells (Treg) constitutively express the high-affinity IL-2Rs and depend crucially on IL-2 for their growth and survival, activated T cells can also express IL-2R and proliferate in response to IL-2 (2, 3). Treg have been shown to suppress T cells and APC in vitro (4), and in vivo inhibit allograft rejection and autoimmune diseases (5, 6). Nevertheless, the role of Treg in infection and immunity remains less definite (4, 7). Some studies suggest that Treg suppress antimicrobial immune responses, leading to enhanced infection or persistence of pathogens (8–11). Other studies demonstrate that Foxp3+ Treg facilitate, but do not suppress, antiviral immunity in mucosal interface (7). It is likely that cellular immunity against infections/diseases results from coordinated immune responses involving Foxp3+ Treg and T effector cells. However, this compelling question is not formally addressed, and thus it is attractive to hypothesize that cytokine-activated Treg and T effector cells can act in concert to control tissue inflammation/damage and contain infection. Tuberculosis (TB) remains one of the leading causes of global morbidity and mortality among infectious diseases largely due to HIV pandemics and multidrug-resistant TB. Precise elements of immunity during primary Mycobacterium tuberculosis infection of humans remain unknown, but might result from a tightly regulated balance of host responses and inflammatory processes. Although TB patients exhibit increased frequencies of Treg (12–15), it is not known whether such increases contribute to development of TB or result from increasing responses to inflammation or tissue damages. Because M. tuberculosis infection evolves TB granulomatous response or process in lungs, it is important to fully investigate pulmonary immune response and TB pathology. To date, whether Treg play a detrimental or protective role regarding TB inflammation or lesions has not been investigated at the pathology level, although adoptive transfer of Treg in mouse TB models can result in some increases in M. tuberculosis burden (16, 17). Recent studies from us and others suggest that immune control of active M. tuberculosis infection is correlated with clonal expansion and efficient pulmonary recruiting of Ag-specific T effector cells (18, 19). However, it is not known whether these protective pulmonary T effector cell responses are indeed balanced or licensed by Treg. In fact, it remains unknown whether simultaneous expansion of Treg and protective T effector cells in pulmonary compartment can lead to favorable or detrimental disease outcome regarding TB inflammation and pathology. In this study, we conducted proof-of-concept studies in macaque TB models and determined whether simultaneous expansion of Treg and T effector cells by IL-2 treatments can allow these cell populations to act in concert to control TB inflammation and lung lesions without enhancing M. tuberculosis replication. A total of 34 cynomolgus monkeys, 4–8 y old, was used in the study. Animal studies were documented in animal protocols and approved by the Institutional Animal Care and Use Committee. Human rIL-2 (rhIL-2; Proleukin, Chiron, Emeryville, CA) was administered as we previously described (20). Briefly, 1.2 million IU human rIL-2 was given once daily for 5 d by s.c. injection in each cycle. The two-cycle intermittent IL-2 treatments started at days −3 and 15 postinfection. No detectable side effects were seen in IL-2–treated macaques. As controls, five animals received saline and four received BSA (27.2 μg) in 0.5 ml s.c. for 5 consecutive days. For the postinfection IL-2 treatment, IL-2 was given similarly for 5 d starting at day 15 after the infection. A total of 500 CFU M. tuberculosis Erdman was spread into bronchoalveolar interface of the right caudal (RC) lung lobe using bronchoscope-guided challenge technique, as we described (21–23). This approach consistently induced severe TB in 100% of all 21 naive macaques that we tested (23–25). This was done as we previously described (21–23). These methods were described in detail in our recent publications (20, 21, 26). PBMC were isolated from freshly collected EDTA blood by Ficoll-PaquePlus (Amersham, Piscataway, NJ) density gradient centrifugation. For isolation of lymphocytes from bronchoalveolar lavage (BAL) fluid, freshly retrieved BAL fluid was filtered through 40-μm cell strainers (BD Pharmingen) into 50-ml conical tubes (BD Pharmingen), followed by 5-min ×1500 rpm centrifugation. The supernatant was gently discarded without disturbing the cell pellets. Cell pellets were then treated with 5 ml RBC blood lysis buffer (Sigma-Aldrich) for 10 min or waited till the suspension became clear and washed once with 5% FBS-PBS. The phosphoantigen compound, nonpeptidic phosphorylated metabolite of isoprenoid biosynthesis [e.g., (E)-4-hydroxy-3-methyl-but-2-enyl pyrophosphate (HMBPP)], specifically recognized by primate Vγ2Vδ2 T cells, but not by others, was produced, characterized, validated, and provided by H. Jomaa (Giessen, Germany). The purity of HMBPP was >98% (27). Purified protein derivative (PPD) and 15-mer overlapping peptides spanning Ag85B or ESAT6 were purchased from Mycos Research (Loveland, CO) and GenScript, respectively. Anti-CD28 (CD28.2; BD Pharmingen) and anti-CD49d (9F10; BD Pharmingen) were used in the assays as costimulatory Abs. The following mAbs were used for surface and intracellular cytokine staining for flow cytometry analyses: CD3 (SP34-2; BD Pharmingen), CD4 (L200; BD Pharmingen), CD8 (DK25; Dako),Vγ2 (7A5; Endogen), anti-Foxp3 Alexa Fluor 647 (259D; BioLegend; used for intracellular staining), IFN-γ allophycocyanin (4S.B3; BD Pharmingen), perforin-biotin (Pf-344; Mabtech, Cincinnati, OH); IL-17 PE (eBio64CAP17; eBioscience), streptavidin-Pacific blue (Invitrogen), and purified mouse IgG isotype control (eBioscience). Fluorescent Abs, including anti-Foxp3 Ab, immune staining of cell surface markers or intracellular Foxp3, and flow cytometry analyses were described in detail in our recent publications (20, 21, 26). Intracellular cytokine staining (ICS) was done, as previously described (20, 21, 26). A total of 105–106 BAL cells or 106 PBL plus mAbs CD28 (1 μg/ml) and CD49d (1 μg/ml) was incubated with Ag85B peptide pool (2 μg/ml), HMBPP (80 ng/ml), or media alone in 200 μl final volume for 1 h at 37°C, 5% CO2, followed by an additional 5-h incubation in the presence of brefeldin A (GolgiPlug; BD). After staining cell surface CD3, CD4, CD8, or Vγ2 for 30 min, cells were permeabilized for 45 min (Cytofix/Cytoperm; BD) and stained for another 45 min to detect IFN-γ and perforin before resuspending in 2% formaldehyde-PBS. Five-color staining flow cytometry analysis was done, as we previously described (20), to measure frequencies of Foxp3+ T cells. The panel for the staining was CD3/CD4/CD8/CD25/Foxp3. To assess Treg function, CD4+CD25+ T cells were isolated from PBL at week 3 using CD4+CD25+ Regulatory T Cell Isolation Kit for macaques (Miltenyi Biotec), as we previously described (20). CFSE-labeled PBMC were mixed at 2 × 105 cells/well with 0 or 1 × 105 PKH26-labeled CD4+CD25+ T cells in the presence or absence of PPD (15 μg/ml; Colorado Serum), HMBPP (40 ng/ml), and 5 μg/ml purified anti-human CD28 and anti-CD3 Abs (20). At days 7 or 8, cells were collected and stained with anti-Vδ2 or anti-Vγ2, anti-CD4, anti-CD8, and anti-CD3 Abs, as described above. Proliferation was analyzed by flow cytometry to determine the dilution of CFSE fluorescence intensity; the percentage of proliferation was calculated based on the number of CFSEdim cells divided by the number of CFSE+ cells (20). The methods were previously described (22, 24, 28). We followed the strategy, as recently described (22), to objectively measure CFU in lungs. Briefly, a half of cut sections of the RC lobe (the infection site), the right middle lobe, or the left caudal lobe from each animal was taken for CFU determination after the extensive gross pathologic evaluation was accomplished. If there were gross TB lesions in the respective lobe, a half of the lung tissue containing ∼50% lesions was taken. If no visible lesions were seen in the respective lobe, a random half of tissue was taken for evaluation. Details were described in our previous publications (22). Briefly, animals were euthanized by i.v. barbiturate overdose, and immediately necropsied in a biological safety cabinet within a BSL-3 facility. Standard gross pathologic evaluation procedures were followed, with each step recorded and photographed at day 65 after M. tuberculosis infection. Lung lobes; bronchial, mesenteric, axillary, and inguinal lymph nodes; tonsils; and other major organs were collected and labeled. Multiple specimens from all tissues with gross lesions and remaining major organs were harvested. Gross observations including but not limited to the presence, location, size, number, and distribution of lesions were recorded. The scoring system (22, 29) was excised to calculate gross pathology scores for TB lesions in lungs infected by bronchoscope-guided inoculation. For each of lung lobes, granuloma prevalence was scored 0–4 for the following: 1) no visible granulomas; 2) 1–3 visible granulomas; 3) 4–10 visible granulomas; 4) >10 visible granulomas; and 5) miliary pattern of granulomas, respectively. Granuloma size was scored 0–3 for the following: 1) none present; 2) <1–2 mm; 3) 3–4 mm; and 4) >4 mm, respectively. Pulmonary consolidation or atelectasis as viewed from organ exterior and cut surfaces was scored 0–2 for the following: 1) absent; 2) present focally in one lobe; and 3) focally extensive within a lobe or involving multiple lobes. One score was also given for the presence of tuberculosis-related focal parietal pleural adhesions, pleural thickening and opacification, or pulmonary parenchymal cavitation. For hilar lymph nodes, enlargements were scored 0–3 for the following: 1) visible but not enlarged; 2) visibly enlarged unilaterally (≤2 cm); 3) visibly enlarged bilaterally (≤2 cm); and 4) visibly enlarged unilaterally or bilaterally >2 cm, respectively. Tuberculosis lesions in hilar lymph nodes were scored 0–4 for the following: 1) no granulomas visible on capsular or cut surface; 2) focal or multifocal, circumscribed, noncoalescing granulomas, <2 mm (≥nodes); 3) coalescing solid or caseating granulomas occupying <50% of nodal architecture (≥nodes); 4) coalescing solid or caseating granulomas occupying >50% of nodal architecture, with residual nodal components still recognizable; and 5) complete granulomatous nodal effacement and caseation, respectively. One score was also given for tuberculosis-associated changes in other thoracic nodes. The tuberculosis lesions in each of the extrathoracic organs were scored similarly as each lung lobe. The pathology scoring of infected tissues was conducted in a blinded fashion. This was done, as we previously described (22, 24, 28). Briefly, the extent of involvement for each lung lobe was determined using digital scans to record total pixel counts on H&E-stained material and specimen area measured in square cm using Image-Pro Plus software (MediaCybernetics, Silver Spring, MD), as previously described (22, 24, 28). Granulomas were objectively compared for size, type (caseous, solid, suppurative, or mixed), distribution pattern (focal, multifocal, coalescing, and invasive), and cellular composition (absence or presence with degrees of lymphocytic cuff, mineralization, fibrosis, multinucleated giant cells, and epithelioid macrophages) between and within monkey groups. 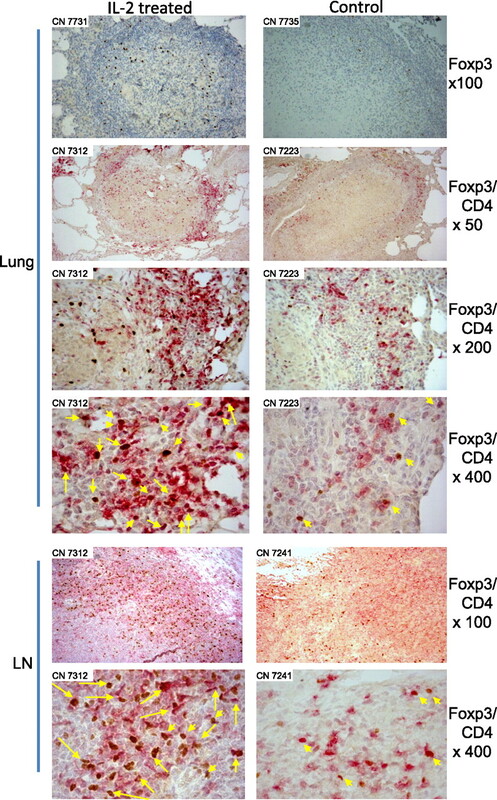 Standard single-color immunohistochemistry protocol was used to stain Foxp3 in lung tissue sections and lymph node sections prepared from paraffin tissues. This was done essentially the same as we recently did (21, 24, 30), except that mouse anti-human Foxp3 mAb (BioLegend; clone 259D) was used in this study as the first Ab. The two-color Foxp3 and CD4 double staining in lung tissue and lymph node sections was done, as we previously described (30). Briefly, Foxp3 was stained as above, with diaminobenzidine as a substrate, followed by the Doublestain Block (Dako), and then stained for CD4 using rabbit anti-human CD4 (Lsbio; LS-B3426) and alkaline phosphatase polymer-conjugated goat anti-rabbit Igs (Dako). Fast red was used as a substrate. Staining colors were as follows: brown for Foxp3, red for CD4, and blue for nuclear. Depleting anti-CD4 mAb (OKT4-HuIgG; National Institutes of Health Nonhuman Primate Reagents Program) was i.v. administered to each of eight macaques at a dose of 50 mg/kg at days −5, 10, and 25, respectively, after M. tuberculosis infection. The multivariate ANOVA and Student t test were used, as previously described (22, 30), to statistically analyze the data for differences between IL-2–treated and control groups. We have recently shown that IL-2 treatment of bacillus Calmette-Guérin–infected macaques can induce expansion of CD4+CD25+Foxp3+ Treg in the blood (20). As initial efforts determining whether IL-2–expanded T effector cells and Treg can act in concert to control TB inflammation/lesions in lung tissues, macaques were treated intermittently with IL-2 regimen during pulmonary M. tuberculosis infection. The first IL-2 treatment was given daily for 5 d, initiating 3 d before M. tuberculosis infection (day −3); the second 5-d IL-2 treatment was given at day 15 after M. tuberculosis infection. As control, a group of macaques was similarly injected with saline or BSA. The intermittent IL-2 treatments reproducibly induced major expansion of CD4+CD25+Foxp3+ T cells in the macaques (Fig. 1A). Each cycle IL-2 treatment expanded CD4+CD25+Foxp3+ T cells up to 25% of CD4+ T cells (Fig. 1A), and to ∼330 absolute Treg per μl blood (Fig. 1A). IL-2 treatment also induced expansion of CD8+CD25+Foxp3+ T cells (Fig. 1A, 1B). Intermittent 5-d IL-2 treatments starting at days −3 and 15 (pointed by arrows) after M. tuberculosis infection induce major transient expansion of CD4+CD25+Foxp3+ Treg and CD8+CD25+Foxp3+ T cells. (A) Representative flow cytometry histograms gated on CD4 (left) and graph data (middle and right) of absolute numbers of CD4+CD25+Foxp3+ T cells and CD8+CD25+Foxp3+ T cells, respectively, in the blood. Graph data are means with SEM from six macaques/group. **p < 0.01, *p < 0.05. Noninfected macaques exhibited similar increases in Treg in pulmonary compartments after IL-2 treatment (data not shown). (B) BAL fluid (BALF) data in a similar fashion as (A), except that numbers in graphs (middle and right) are percentages of CD4+ or CD8+ T cells (n = 6). Increases in Foxp3+ cells in BALF corresponded to accumulation of them in lung tissues of treated macaques (data not shown). (C) Purified CD4+CD25+ T cells inhibited PPD-stimulated CD4+ T cell proliferation and HMBPP-stimulated γδ T cell proliferation. Approximately 87% of purified CD4+CD25+ T cells expressed Foxp3. Left panel, Representative flow cytometry histograms for the data from CFSE-based proliferation assay, with percentage numbers of proliferating cells (left-shifting CSFEdim cells) indicated. The 0:2(+Ab) or 1:2(Tr+ Ab) ratio indicated that 0 or 1 × 105 CD4+CD25+ T cells (Tr) were incubated with 2 × 105 PBL of IL-2–treated macaques in the presence of anti-CD3/anti-CD28 Ab, whereas the 0:2(+PPD) or 1:2(Tr+ PPD) ratio denoted that 0 or 1 × 105 Tr were incubated with 2 × 105 PBL of IL-2–treated macaques in the presence of PPD (see Materials and Methods). The middle two bar panels show the Foxp3+ cell-driven suppression of PPD-specific T cell proliferation and HMBPP(H)-specific γδ T cell proliferation, respectively. The 0:2(PPD) or 1:2(PPD) ratio indicates that 0 or 1 × 105 Tr were incubated with 2 × 105 PBL of IL-2–treated macaques (n = 5) in each of five wells in the presence of PPD, with anti-CD3/anti-CD28 Ab as positive control (see Materials and Methods). The 0:2(H) or 1:2(H) ratio denotes 0 or 1× 105 Tr mixed with 2 × 105 PBL containing γδ T cells in presence of HMBPP. 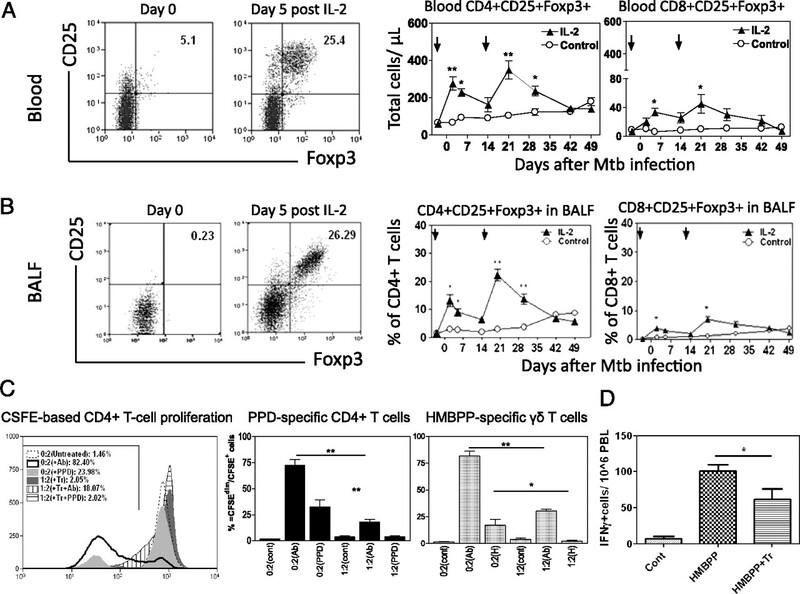 (D) CD4+CD25+ T cells purified from BAL cells at day 5 after IL-2 treatment suppressed HMBPP-driven production of IFN-γ by autologous γδ T cells in PBL. CD4+CD25+(Tr):PBL ratio was 1:2, n = 4. Assay was done as previously described (24). Notably, intermittent IL-2 treatment regimen induced trafficking/accumulation of CD4+CD25+Foxp3+ Treg and CD8+CD25+Foxp3+ T cells in the pulmonary compartment as apparent increases in numbers of these cells were seen in the BAL fluid after each of the IL-2 treatments (Fig. 1B). The increases in Treg and T effectors in BAL fluid after the treatment consisted of increased accumulation of these T cells in lung tissues (30) (data not shown). As demonstrated before (20), CD4+CD25+ T cells containing Foxp3+ T cells after IL-2 treatment indeed inhibited immune responses of PPD-specific and HMBPP-specific T cells (Fig. 1C, 1D). Thus, intermittent IL-2 treatments during pulmonary M. tuberculosis infection expanded CD4+CD25+Foxp3+ Treg in the circulation and pulmonary compartment. We have recently shown that rapid clonal expansion and pulmonary accumulation of CD4+ and CD8+ T effector cells producing IFN-γ correlate with vaccine-induced anti-TB immunity (19). Therefore, in this study, we sought to determine whether IL-2 treatments, although expanding Treg, also expand T effector cells and induce trafficking/accumulation of these T effectors in pulmonary compartment. Interestingly, despite Treg expansion, apparent increases in numbers of CD4+ T, CD8+ T, and Vγ2Vδ2 T effector cells producing anti-TB cytokine IFN-γ or perforin (31, 32) after Ag stimulation were seen in the blood (Fig. 2A, 2B). These T effector populations were detected even without Ag stimulations using our modified ICS assay (Fig. 2A, 2C) (26, 33). There were similar increases in TNF-α–producing T cells (data not shown), but not IL-17–producing T cells (Fig. 2D). Furthermore, IL-2–expanded Treg did not appear to inhibit pulmonary migration of T effectors, as accumulation of CD4+ T, CD8+ T, and γδ T effector populations was detected in BAL fluid of the IL-2–treated macaques (Fig. 2A–C). Virtually, the IL-2–expanded T effector cells in pulmonary compartment peaked at the same time as did those IL-2–expanded Foxp3+ Treg (Figs. 1, 2), suggesting that despite Treg expansion, T effector populations were still increased in blood and pulmonary compartment after IL-2 treatments. Despite Treg expansion, CD4+ T, CD8+ T, and γδ T effectors were still increased in blood and pulmonary compartment after intermittent 5-d IL-2 treatments during M. tuberculosis infection. (A) Representative cytometry histograms of T effector cells measured by ICS with or without Ag stimulation at day 5 after the second IL-2 or saline treatment (day 20 after M. tuberculosis infection). (B) Compares effector cells detected by ICS after in vitro stimulation with pooled Ag85B and ESAT6 peptides, and HMBPP (for Vγ2Vδ2+ T effectors), respectively. n = 6/group. *p < 0.05 and **p < 0.01, respectively, for comparisons between IL-2–treated and control groups. (C) Frequencies of CD8+, CD4+, and Vγ2Vδ2+ T effector cells measured by ICS without Ag stimulation between the control and IL-2–treated groups are compared. n = 6/group. (D) Frequencies of blood T effector cells producing IL-17 after in vitro Ag85B/ESAT6 stimulation between the control and IL-2–treated groups are compared. n = 5. We then asked whether IL-2 treatments during M. tuberculosis infection would lead to Treg-associated suppression of anti-TB immunity or favorably confer a Treg-T effector–coordinated resistance to TB inflammation and lesions. Surprisingly, IL-2 treatments, although expanding Treg and T effector populations, led to apparent resistance to lung TB inflammation and lesions (Fig. 3A). The comparative efficacy evaluation at day 65 after M. tuberculosis infection demonstrated that control macaques treated with saline or BSA consistently showed severe TB lesions, characterized by caseation pneumonia or extensive coalescing granulomas at the RC (infection site) and other lung lobes as well as enlarged hilar lymph nodes with caseation (Fig. 3A, upper panels). In contrast, most IL-2–treated macaques showed focal or less-coalescing granulomas mostly limited to the RC lobe, without apparent occurrence of enlarged hilar lymph nodes (Fig. 3A). Gross TB granulomas or lesions were not seen at necropsy for one of nine IL-2–treated macaques. The digital microscopy screening of tissues from this animal revealed microscopy granulomas in the lung tissue sections from the RC lobe (Figs. 3A, 4). When gross pathology scores were individually calculated (22) and statistically analyzed between IL-2–treated and control groups, the IL-treated group showed significantly milder gross TB pathology (Fig. 3B, p < 0.01). IL-2 treatments during early M. tuberculosis infection, while expanding Treg and T effectors, surprisingly conferred resistance to severe TB lesions, without causing Treg-associated increases in M. tuberculosis bacterial burdens. (A) Digital photos of cut sections of lung lobes from 8 representatives of 18 macaques (9 IL-2 treated and 9 controls treated with saline or BSA). Lungs and other organs were obtained in complete necropsy at day 65 after M. tuberculosis infection. Macaque ID numbers are shown in upper left corners, with the RC lobe (infection site) indicated in each photo. Extent and severity of the lesions could be adjudged based on the examples pointed by large arrows for caseation pneumonia or extensive coalescing granulomas and by small arrows for less coalescing or small granulomas. Yellow arrows indicate the enlarged hilar lymph nodes with caseation. Note that the IL-2–treated macaque ID 7563 did not show any detectable gross TB lesions, although small microscopic granulomas were detected in histology sections of the RC lobe. Additional 5 IL-2–treated macaques displayed focal or less-coalescing granulomas mostly limited to the RC lobe, without apparent occurrence of enlarged hilar lymph nodes. Small vertical/horizontal bars at upper right corner of each photo represent the 1-cm scale derived from the fluorescence rulers of original photos. Greater than 50% of controls versus 10% of IL-2–treated macaques had extrathoracic TB dissemination. The efficacy evaluation was done sequentially in three separate trials using a total of 18 macaques. (B) Mean gross pathology scores for IL-2–treated and control groups. The scores were calculated and compared, as we previously described (22). (C) Simultaneous expansion of Foxp3+ Treg and T effector populations did not result in Treg-associated increases in bacterial burdens in lungs. Shown are mean CFU counts in BAL fluid over time before the end time point (left) and in lung tissue homogenates (right) of different lung lobes collected at the end point from IL-2–treated and control groups. A total of 10 ml BAL fluid/cells and 10 ml lung tissue homogenates was used for CFU enumeration, respectively. The significantly higher M. tuberculosis CFU in BAL fluid were seen in the control group (C, left), and this might be due to the fact that TB necrosis process was taking place and releasing more bacterial organisms into the airway over time before the end point. p < 0.05 for comparisons in BAL at weeks 3–6; p > 0.05 for comparisons of CFU counts in tissue homogenates of RC, right middle, and left caudal lung lobes between the IL-2–treated and control groups. n = 9/group. *p < 0.05, **p < 0.01. TB granulomas in IL-2–treated group were less necrotic than those in controls. Histopathology analyses show that control macaques exhibited widespread necrosis, fulminant TB pneumonia, and TB hemorrhage/thrombosis lesions. The alveolar septa are destroyed or indistinct. In contrast, most TB granulomas in lung sections of the IL-2–treated group were well contained and lymphocytic (note the lymphocyte cuff), without widespread necrosis. Original magnification ×100 for all photos. Similar contrasting data were also seen in other controls and IL-2–treated macaques, respectively. Consistently, the histopathology evaluation demonstrated that the IL-2–treated group exhibited much milder TB lesions than the control group (Fig. 4). In the control group, most lung tissue sections showed widespread necrosis or TB pneumonia (Fig. 4). In contrast, most TB granulomas in the lung sections of the IL-2–treated group were well contained and highly lymphocytic, without extensive necrosis (Fig. 4). Immunohistochemistry analyses showed that Foxp3+CD4+ T cells were detectable in the small protective granulomas and hilar lymph nodes from IL-2–treated macaques even at the time the IL-2 treatment had ended for 45 d (M. tuberculosis endpoint was day 65) (Fig. 5). Control macaques appeared to exhibit few Foxp3+ cells in nonprotective granulomas and hilar lymph nodes (Fig. 5). Foxp3+CD4+ T cells in lungs and lymph nodes were readily detected in the context of attenuated TB lesions in IL-2–treated macaques. Even at 6 wk after discontinuation of IL-2 treatment, Foxp3+CD4+ T cells were readily detectable in granulomatous lung tissues (Lung) and hilar lymph nodes (LN) from IL-2–treated macaques, but less frequently seen from control macaques. Actually, no or few Foxp3+ cells were detected in most necrotic TB lesions from the controls. Top panels, Single-staining immunohistochemistry analyses of Foxp3, whereas other panels are double-staining analyses of Foxp3 and CD4 (Foxp3/CD4). Macaque ID and image magnification are displayed in upper left corner and on right, respectively. Foxp3+CD4+ T cells are stained as dark red and pointed by yellow arrows in original magnification ×400 image sections (long yellow arrows denote ≥2 Foxp+CD4+ cells in the directions or areas); Foxp3−CD4+ T cells are stained as purple-red. Similar data were seen for other four IL-2–treated and four control macaques. Interestingly, in the presence of both Treg and T effector populations, we found no increases in M. tuberculosis replication in lung tissues (Figs. 2, 3C). The attenuation of TB pathology (Fig. 3A, 3B) coincided with the lower levels (without statistical significance) of M. tuberculosis CFU in lung tissue homogenates of IL-2–treated macaques compared with controls (Fig. 3C). Thus, IL-2 treatments during early M. tuberculosis infection simultaneously expanded Foxp3+ Treg and T effector populations, and conferred resistance to severe TB lesions. The observation that intermittent IL-2 treatments at days −3 and 15 after M. tuberculosis infection could confer resistance to severe TB prompted us to determine whether postinfection IL-2 treatment at day 15 after pulmonary M. tuberculosis infection could also expand Foxp3+ Treg and T effector cells, and confer resistance to TB lesions. Similarly, the postinfection IL-2 treatment simultaneously expanded Foxp3+ Treg and T effector populations in blood and pulmonary compartment at day 5 after IL-2 treatment (day 20 after M. tuberculosis infection) (Fig. 6A). Such single IL-2 treatment still conferred resistance to TB lesions (Fig. 6B, 6C, p < 0.05), without Treg-associated increases in M. tuberculosis CFU in lungs (Fig. 6D). Postinfection IL-2 treatment starting at day 15 after pulmonary M. tuberculosis infection also induced increases in Foxp3+ Treg and T effector cells, and conferred resistance to severe TB lesions in four IL-2–treated M. tuberculosis-infected macaques. Gross pathology analyses for single IL-2 treatment group were also done at day 65 after M. tuberculosis infection. (A) Representative data showing IL-2 expansion of Foxp3+ T cells and T effectors at day 5 (peak expansion) after single IL-2 treatment (day 20 after M. tuberculosis infection). n = 4 for IL-2 group. Major expansion of other CD4+ T, CD8+ T, and γδ T effector cells was also seen in blood and BAL fluid (data not shown). (B) Representative gross pathology in cut sections and representative histopathology. Original magnification ×200 for IL-2 group, ×100 for Control group. (C) Comparative pathology scores between 1× IL-2–treated, 2× IL-2–treated, and control groups. (D) IL-2 treatment, while expanding Treg and T effectors, does not cause Treg-associated increases in M. tuberculosis burdens. ***p < 0.001. Because IL-2 expanded T effectors, Treg might not be the sole element for IL-2–induced resistance to TB lesions. We therefore sought to determine whether depleting CD4+ T effectors and Foxp3+ CD4+ T cells could lead to changes in IL-2–induced resistance to TB lesions. We believed that depletion of CD4+ T cells was the reasonable mechanistic experiment because of the following major reasons: 1) IL-2 treatment mostly expanded CD4+Foxp3+ T cells and CD4+ T effectors; 2) CD4+ T cells play a major role in anti-M. tuberculosis infection (34); and 3) specific depletion of Foxp3+ Treg in nonhuman primates is challenging because in vivo treatment of macaques with ONTAK immunotoxin only led to a partial reduction of CD25+ T cells and Foxp3+ T cells (35). Thus, two groups of macaques were depleted of CD4+ T cells by administration of depleting anti-CD4 Ab, and then treated similarly with intermittent IL-2 regimen and saline (control), respectively, during early M. tuberculosis infection. IL-2–treated, CD4-depleted macaques were then evaluated for a loss or reduction of IL-2–induced resistance to severe TB. Treatments using depleting humanized OKT4A anti-CD4 Ab (36) efficiently depleted CD4+ T cells in blood (Fig. 7A, left) and abrogated IL-2 expansion of CD4+CD25+Foxp3+ Treg (Fig. 7A, middle/right) and CD4+ T effector cells (Fig. 7B, left) during M. tuberculosis infection. IL-2 treatment of CD4-depleted macaques only expanded CD8+Foxp3+ T cells (Fig. 7A, middle/right) and to some extent CD8+ T effectors (Fig. 7B, left) and γδ T effectors, but not CD4+ T cells (Fig. 7B, right). The macaques deleted of CD4+ T cells during M. tuberculosis infection developed much worse TB lesions than those animals without CD4 depletion (Fig. 7C). Interestingly, IL-2–treated CD4-depleted macaques developed less severe TB lesions than saline-treated CD4-depleted animals, although there was no significant difference in M. tuberculosis burdens between these two CD4-depleted groups (Fig. 7C). Notably, IL-2–treated CD4-depleted macaques exhibited worse TB lesions than those IL-2–treated macaques without CD4 depletion (Fig. 7C), suggesting that IL-2–induced homeostatic protection against TB was significantly reduced by the depletion of IL-2–expanded CD4+Foxp3+ Treg and CD4+ T effectors. Depletion of IL-2–expanded CD4+Foxp3+ Treg and CD4+ T effector cells reduced, but did not eliminate, IL-2–induced homeostatic protection against TB lesions. (A) A complete in vivo deletion of CD4+ T cells (left graph) by anti-CD4 Ab treatment during M. tuberculosis infection, and blockage of IL-2 expansion of CD4+Foxp3+ Treg (middle and right graphs). Data were collected on day 5 (D5) after the first (1st) and the second (2nd) IL-2 treatment as day 5 after each IL-2 treatment is the peak time for Foxp3+ T cell expansion (see Fig. 1). 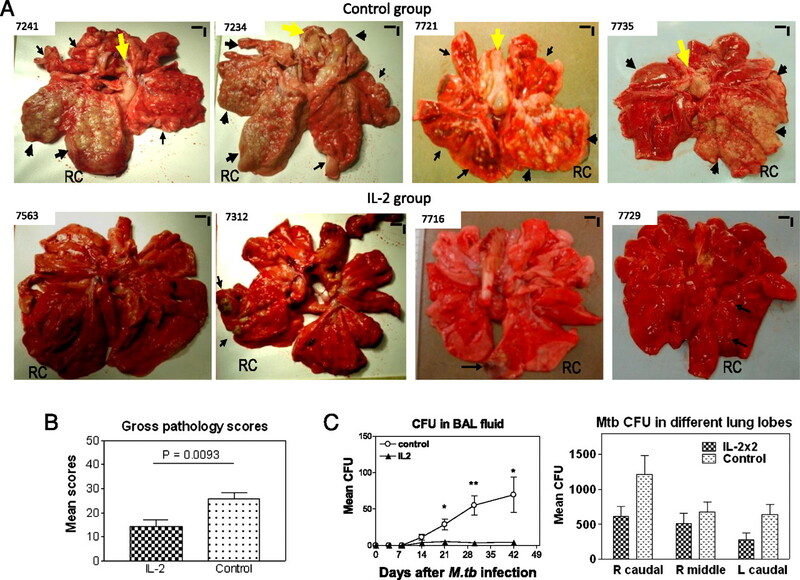 (B) CD4 depletion blocked the ability of IL-2 to expand CD4+ T effectors during M. tuberculosis infection. Effector CD8+ T and γδ T cells were detectable. (C) Left graph, CD4 depletion significantly reduced IL-2–induced resistance to TB lesions (see the first and second bars [from left] for comparison between IL-2–treated CD4-depleted [IL-2/CD4−] group and IL-2–treated CD4-not-depleted [IL-2/CD4+] group), but IL-2 treatments still led to detectable resistance to severe TB lesions in the absence of CD4+ T cells (see the second and third bars for comparison between saline-treated [Cont/CD4−] and IL-2–treated [IL-2/CD4−] groups). Another control group, saline-treated CD4-not-depleted (Cont/CD4+) group, was also included for comparison. (C) Right graph, No statistical difference in mean M. tuberculosis CFU counts from lung lobe homogenates between IL-2–treated CD4-depleted group (IL-2) and control saline-treated CD4-depleted group (Control). Note that extrathoracic TB lesions were seen in the control group, but not in the IL-2–treated group after CD4 depletion. Both IL-2 and control groups of macaques (8 animals) were treated with humanized OKT4A-depleting mAb at a dose of 50 mg/kg on days −5, 10, and 25 after M. tuberculosis infection. Intermittent IL-2 treatments, M. tuberculosis infection, and evaluations of gross pathology and bacterial burdens were essentially the same as those described above for those macaques without CD4 depletion. The data in this figure are compared between the groups based on our previous observation that control isotype Ab treatment of macaques during M. tuberculosis infection does not cause significant depletion or expansion of CD4+ T effector cells, CD4+Foxp3+ T cells, CD8+ T effector cells, or γδ T effector cells when compared with saline-treated macaques (Ref. 22 and data not shown). *p < 0.05, **p < 0.01, ***p < 0.001. We have made a novel discovery that IL-2 treatment in early-stage M. tuberculosis infection could simultaneously expand Foxp3+ Treg and CD4+/CD8+/γδ T effector cells, and confer resistance to severe TB inflammation and lesions. Such homeostatic protection was not accompanied by Treg-associated increases in M. tuberculosis bacterial burdens. These findings suggest that simultaneous expansion of Treg and T effector cells allows these cell populations to act in concert to attenuate severe lung damages or lesions in infections. Our novel observations were made at pathology and immunology levels in the macaque TB model perhaps due to the fact that macaque TB models displayed more prominent human TB pathology than do mouse TB models (22). IL-2 induced simultaneous transient expansion of Foxp3+ Treg and T effector cells during M. tuberculosis infection. Similar kinetics of IL-2 expansion of Treg and T effector cells were seen in the circulation and pulmonary compartment during the treatment. Given the possibility that before M. tuberculosis infection, low-level CD4+ T, CD8+ T, or γδ T effector cells may have been exposed to environmental nonpathogenic microbes, including nontuberculous mycobacteria, as described in humans (37), it would not be surprising that IL-2 treatments could expand CD4+/CD8+/γδ T effector cells producing IFN-γ and perforin. We also could not exclude the possibility that IL-2 treatments may enhance the ability of those non-Ag–specific αβ T/γδ T cells to proliferate and expand in response to in vitro M. tuberculosis Ag stimulation (potential bystander effects). We did not see Treg-associated increases in M. tuberculosis burdens in lungs (20) during primary M. tuberculosis infection of macaques, despite simultaneous pulmonary accumulation of IL-2–expanded Foxp3+ Treg and T effector cells. In the presence of both Treg and T effector cell populations, M. tuberculosis replication was not increased in lung tissues (Figs. 2, 3C). Virtually, coincident with the attenuation of TB (Fig. 3A, 3B) were the lower levels of M. tuberculosis CFU in lung tissue homogenates of IL-2–treated macaques compared with controls, although such decreases were not statistically significant (Fig. 3C). IL-2–induced resistance to severe TB lesions might involve an optimal balance or cooperation between IL-2–expanded CD4+ T effectors and Treg. Due to the lack of reagents specifically depleting Foxp3+ T cells in macaques (35), we were not able to evaluate the relative importance of Foxp3+ Treg versus CD4+/CD8+/γδ T effector cells. Nevertheless, our mechanistic studies depleting CD4+Foxp3+ Treg and CD4+ T effector cells showed that a loss of these two CD4+ T cell populations led to reduction in IL-2–induced resistance to TB lesions. IL-2–expanded Treg (20, 38, 39) may act as regulators downregulating M. tuberculosis-driven inflammation and lesions. 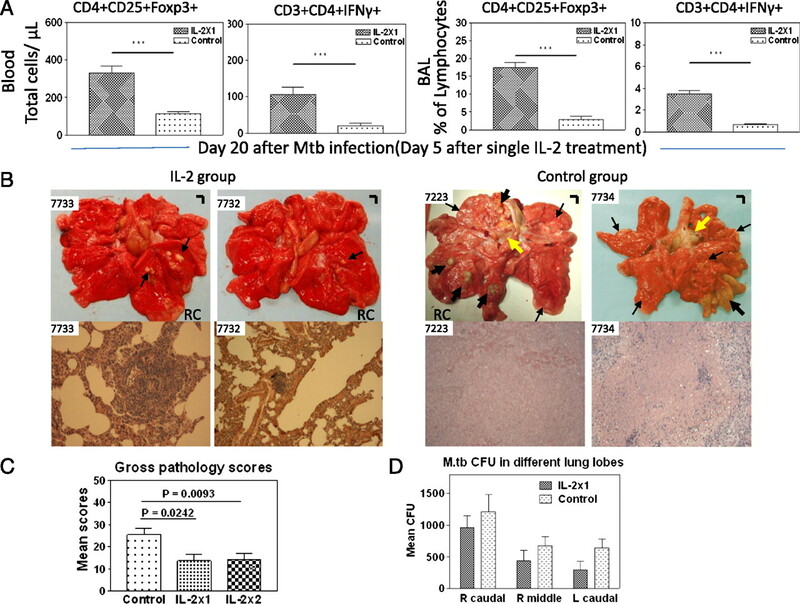 IL-2–expanded CD4+ T effectors producing anti-TB cytokines IFN-γ and perforin may also confer resistance to active M. tuberculosis infection and TB lesions because CD4+ T effector cells producing IFN-γ are crucial for anti-TB function in mice (18), HIV-1–infected humans (40), and SIV-infected macaques (41). The role of IL-2–expanded CD8+Foxp3+ T cells, CD8+ T effector cells, and Vγ2Vδ2 T effectors cannot be fully evaluated in the current study, although CD8+ T cells can play a role in anti-TB immunity (22) and rapid recall-like expansion of Vγ2Vδ2 T cells can coincide with immunity against acutely fatal TB in juvenile rhesus macaques (42). Rapid simultaneous recruitments of IL-2–expanded Treg and T effector cells to lungs during IL-2 treatment of early M. tuberculosis infection appear to be critical for mounting immune resistance to severe TB lesions in lungs. This is consistent with our recent observation that rapid clonal expansion and efficient pulmonary trafficking of Ag-specific T effector cells producing IFN-γ are one of the immune mechanisms underlying bacillus Calmette-Guérin vaccine-induced anti-TB immunity in macaques (19). It is important to note that whereas IL-2–expanded Treg can readily traffic to and accumulate in lungs, these Treg do not appear to suppress trafficking/accumulating of CD4+, CD8+, and γδ T effector cells in pulmonary compartment. Significant numbers of Foxp3+CD4+ T cells are still detected among the total CD4+ T cell population in the TB granulomas of IL-2–treated macaques at the end point even though the IL-2 treatment stops 6 wk earlier (Fig. 5). This result and lung Treg function (Fig. 1D) implicate a reservation of Foxp3+CD4+ Treg histology and Treg function relevant to attenuation of TB lesion after they traffic to and accumulate in lung tissues. In fact, in patients with postprimary TB, TB damages in lung tissues appear to attract increases in Treg (43). In this study, in the macaque model of primary M. tuberculosis infection, simultaneous pulmonary accumulation of Treg and T effector cells during IL-2 treatments suggests that IL-2 may superimpose the cooperation between these cell populations balancing anti-TB immunity. Further studies appear to be justified to determine whether IL-2–induced cooperation between T effectors and Treg indeed delays pathology development or confers long-term benefits. Our findings suggest that the benefit for IL-2 treatment of severe TB is to create an optimal balance between Foxp3+ Treg and T effector cells. IL-2 treatment may provide efficient cytokine signaling for both Foxp3+ Treg and activated T effectors that express high-affinity IL-2Rs. Such cosignaling effects would ensure simultaneous stimulation and expansion of Foxp3+ Treg and T effectors. This may optimally develop a balance between CD4+Foxp3+ Treg and CD4+ T effector cells required for immune control of TB lesions or tissue damages because overwhelming dominance of Treg alone or T effectors alone may have harmful effects. The IL-2–induced balance or cooperation between Treg and T effector cells may serve as a rationale for IL-2–based treatment of severe TB. This might indeed help to explain the IL-2–induced resistance to TB lesions without causing Treg-associated increases in M. tuberculosis burdens (16, 17). Our previous and current studies reproducibly demonstrate that pulmonary infection of naive macaques at a dose of ∼500 CFU M. tuberculosis inevitably leads to high M. tuberculosis burden and severe TB lesions (23, 25, 33). High bacilli burden and severe TB lesions may result from overreacting inflammatory responses, because severe TB infection coincides with the inadequate overexpression of many immune molecules relevant to inflammation (21, 25). It is likely that rapidly expanded Treg during IL-2 treatments of the initial M. tuberculosis infection can downregulate the overreacting inflammatory responses and attenuate TB lesions. Such IL-2/Treg-driven control of TB lesions is indeed in line with a critical role for IL-2–expanded Treg in preventing mice from inflammatory diseases of autoimmunity (44). In contrast, IL-2–expanded T effector cells producing anti-TB cytokines IFN-γ and perforin may play a role in containing M. tuberculosis infection. The potential tissue damages caused by these T effector cells may be limited by IL-2–expanded Treg. The overacting Treg function might also be discounted by Vγ2Vδ2 T effectors or other T effectors as activated Vγ2Vδ2 T effectors can antagonize the ability of IL-2 to overexpand Foxp3+ Treg (20). Thus, IL-2 treatments in early M. tuberculosis infection can simultaneously expand Foxp3+ Treg and T effector populations in blood and pulmonary compartment, and conferred resistance to severe TB inflammation and lesions. The simultaneous pulmonary accumulation of IL-2–expanded Treg and T effector cells in early M. tuberculosis infection may be advantageous to single dominance of either Treg or T effectors, and somehow differs from simple Treg suppression of T cell responses as seen in lymphoid organs or in the in vitro assays. One study of rIL-2 adjunctive treatment in TB patients showed some effects (45), whereas another one reported a lack of IL-2–enhanced clearance of M. tuberculosis in TB drug-susceptible patients who received rIL-2 and four TB drugs (isoniazid, rifampin, pyrazinamide, and ethambutol) when compared to controls treated with the four TB drugs and placebo (46). The lack of IL-2–enhanced effects (46) might be due to the fact that the four anti-TB drugs overwhelmingly clear bacilli/TB and overshadow IL-2 benefits. The difference between human and macaque studies might be attributed to a number of factors, including stage or nature (postprimary versus primary TB) of M. tuberculosis infection, IL-2 dosing, and efficacy for expanding both T effectors and Treg. Thus, our novel findings in primary M. tuberculosis infection may hold the potential to apply IL-2–expanded Treg and T effector cells for fine-tuning host responses as immunotherapeutics against human TB or multidrug-resistant TB. We thank Dr. Keith Reimann for providing the depleting anti-CD4 mAb and other Chen laboratory staff for technical assistance. This work was supported by National Institutes of Health R01 Grants HL64560 and RR13601 (both to Z.W.C.).
. 1993. The IL-2/IL-2 receptor system: a current overview. Cell 73: 5–8. 2004. Naturally arising CD4+ regulatory T cells for immunologic self-tolerance and negative control of immune responses. Annu. Rev. Immunol. 22: 531–562.
. 2008. Coordination of early protective immunity to viral infection by regulatory T cells. Science 320: 1220–1224.
. 2005. Natural regulatory T cells in infectious disease. Nat. Immunol. 6: 353–360.
. 2002. CD4+CD25+ regulatory T cells control Leishmania major persistence and immunity. Nature 420: 502–507.
. 2007. 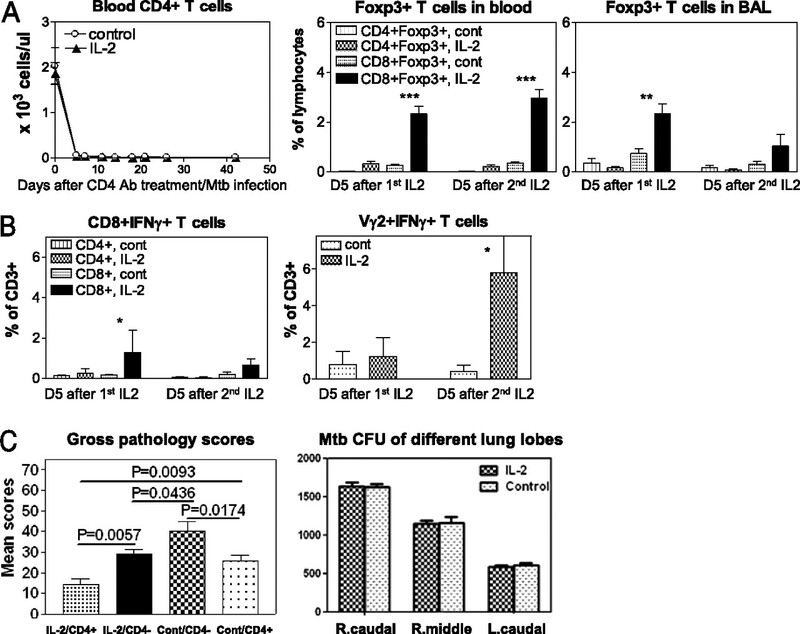 Expansion and function of Foxp3-expressing T regulatory cells during tuberculosis. J. Exp. Med. 204: 2159–2169.
. 2009. Regulatory T cells suppress antiviral immune responses and increase viral loads during acute infection with a lymphotropic retrovirus. PLoS Pathog. 5: e1000406.
. 2008. Mannose-capped lipoarabinomannan- and prostaglandin E2-dependent expansion of regulatory T cells in human Mycobacterium tuberculosis infection. Eur. J. Immunol. 38: 459–469.
. 2007. Increased frequency of CD4(+)CD25(high) Treg cells inhibit BCG-specific induction of IFN-gamma by CD4(+) T cells from TB patients. Tuberculosis 87: 526–534.
. 2009. FoxP3+ regulatory T cells suppress effector T-cell function at pathologic site in miliary tuberculosis. Am. J. Respir. Crit. Care Med. 179: 1061–1070.
. 2009. Patients with multidrug-resistant tuberculosis display impaired Th1 responses and enhanced regulatory T-cell levels in response to an outbreak of multidrug-resistant Mycobacterium tuberculosis M and Ra strains. Infect. Immun. 77: 5025–5034.
. 2010. Pathogen-specific regulatory T cells delay the arrival of effector T cells in the lung during early tuberculosis. J. Exp. Med. 207: 1409–1420.
. 2010. TCR repertoire, clonal dominance, and pulmonary trafficking of Mycobacterium-specific CD4+ and CD8+ T effector cells in immunity against tuberculosis. J. Immunol. 185: 3940–3947.
. 2009. 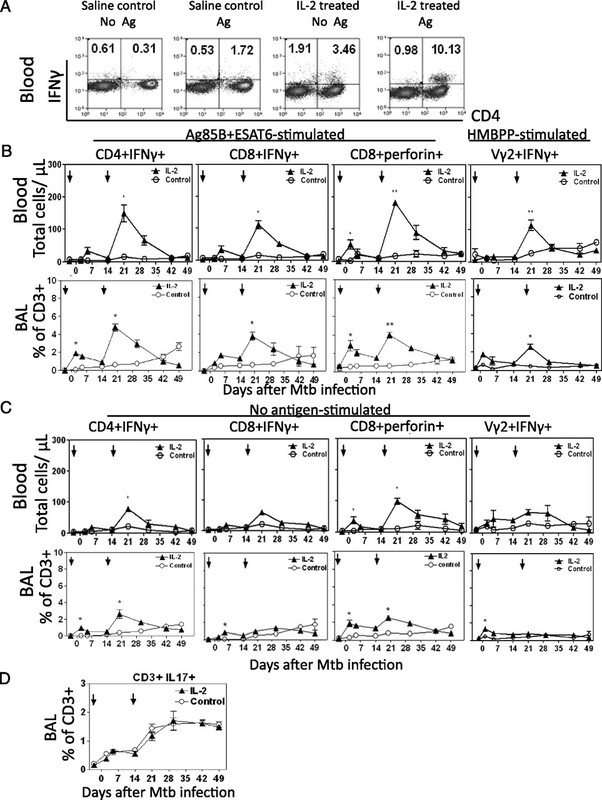 Phosphoantigen-activated V gamma 2V delta 2 T cells antagonize IL-2-induced CD4+CD25+Foxp3+ T regulatory cells in mycobacterial infection. Blood 113: 837–845. Yao, S., D. Huang, C. Y. Chen, L. Halliday, G. Zeng, R. C. Wang, and Z. W. Chen. Differentiation, distribution and gammadelta T cell-driven regulation of IL-22-producing T cells in tuberculosis. PLoS Pathog. 2010; 6: e1000789.
. 2009. A critical role for CD8 T cells in a nonhuman primate model of tuberculosis. PLoS Pathog. 5: e1000392.
. 2009. DR*W201/P65 tetramer visualization of epitope-specific CD4 T-cell during M. tuberculosis infection and its resting memory pool after BCG vaccination. PLoS One 4: e6905.
. 2008. Severe tuberculosis induces unbalanced up-regulation of gene networks and overexpression of IL-22, MIP-1alpha, CCL27, IP-10, CCR4, CCR5, CXCR3, PD1, PDL2, IL-3, IFN-beta, TIM1, and TLR2 but low antigen-specific cellular responses. J. Infect. Dis. 198: 1514–1519.
. 2009. Gammadelta T cell immune manipulation during chronic phase of simian HIV infection confers immunological benefits. J. Immunol. 183: 5407–5417.
. 2009. Efficacy and safety of live attenuated persistent and rapidly cleared Mycobacterium tuberculosis vaccine candidates in non-human primates. Vaccine 27: 4709–4717.
. 2006. Early events in Mycobacterium tuberculosis infection in cynomolgus macaques. Infect. Immun. 74: 3790–3803.
. 2008. The role of cytokines in the initiation, expansion, and control of cellular immunity to tuberculosis. Immunol. Rev. 226: 191–204.
. 2001. The relative importance of T cell subsets in immunity and immunopathology of airborne Mycobacterium tuberculosis infection in mice. J. Exp. Med. 193: 271–280.
. 2008. Cutting edge: experimentally induced immune activation in natural hosts of simian immunodeficiency virus induces significant increases in viral replication and CD4+ T cell depletion. J. Immunol. 181: 6687–6691.
. 2005. Smallpox vaccine-induced antibodies are necessary and sufficient for protection against monkeypox virus. Nat. Med. 11: 740–747. 2002. Newly described or emerging human species of nontuberculous mycobacteria. Infect. Dis. Clin. North Am. 16: 187–220.
. 2010. In vivo expansion of naive and activated CD4+CD25+FOXP3+ regulatory T cell populations in interleukin-2-treated HIV patients. Proc. Natl. Acad. Sci. USA 107: 10632–10637.
. 2005. In vivo expansion of CD4CD45RO-CD25 T cells expressing foxP3 in IL-2-treated HIV-infected patients. J. Clin. Invest. 115: 1839–1847.
. 2003. Human immunity to M. tuberculosis: T cell subsets and antigen processing. Tuberculosis 83: 98–106. 2004. Immunology of AIDS virus and mycobacterial co-infection. Curr. HIV Res. 2: 351–355.
. 2011. Immunopathology of postprimary tuberculosis: increased T-regulatory cells and DEC-205-positive foamy macrophages in cavitary lesions. Clin. Dev. Immunol. 2011:307631.
. 2009. In vivo expansion of T reg cells with IL-2-mAb complexes: induction of resistance to EAE and long-term acceptance of islet allografts without immunosuppression. J. Exp. Med. 206: 751–760.
. 1997. rhuIL-2 adjunctive therapy in multidrug resistant tuberculosis: a comparison of two treatment regimens and placebo. Tuber. Lung Dis. 78: 195–203.
. 2003. Randomized trial of adjunctive interleukin-2 in adults with pulmonary tuberculosis. Am. J. Respir. Crit. Care Med. 168: 185–191.